Monarch Air Group provides private air charter in Shreveport, LA. Our clients benefit from top-notch service, unrelenting dedication to safety, wide selection of aircraft, and years of experience in chartering private jets. To obtain a free quote, please use our online quoting tool provided below, or call toll free 1-877-281-3051. Monarch Air Group provides private jet charter flights in and out of Shreveport, Louisiana, USA. 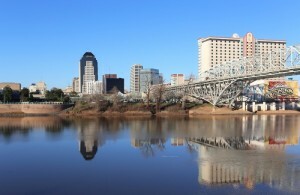 Shreveport is an industrial city in northwestern Louisiana, on the Red River, near the border with Texas. With a population of about 199,311 people, it is the 3rd largest city in Louisiana. The city is also the cultural and commercial center of the Ark-La-Tex. The most popular tourist attractions include R. W. Norton Art Gallery, Cathedral of St. John Berchmans, 8th Air Force Museum, Louisiana State Exhibit Museum, Sci-Port: Louisiana’s Science Center, Jubilee Zoo, Shreveport Convention Center, Gardens of the American Rose Center, Southern University Museum of Art at Shreveport, and much more. The city is served by Shreveport Regional Airport (SHV / KSHV), which is located 9 miles from the center of Shreveport. 1. AGO, Municipal, Magnolia, United States. 2. ASL, Harrison County, Marshall, United States. 3. BAD, Barksdale AFB, Shreveport, United States. 4. DTN, Shreveport Downtown, Shreveport, LA, United States. 5. GGG, Kilgore, Kilgore, United States. 6. RSN, Ruston, Ruston, United States. 7. SHV, Regional, Shreveport, United States. 8. TXK, Municipal, Texarkana, United States. 1. America’s Best Value Inn, Isle of Capri Blvd, Bossier City. 2. Horseshoe Bossier City, 711 Horseshoe Boulevard, Bossier City. 3. Sam’s Town Hotel & Casino, 315 Clyde Fant Parkway, Shreveport. 4. Holiday Inn Hotel Shreveport, 102 Lake Street, Shreveport. 5. America’s Best Value Inn, Isle of Capri Blvd, Bossier City. 6. Horseshoe Bossier City, 711 Horseshoe Boulevard, Bossier City. 7. Sam’s Town Hotel & Casino, 315 Clyde Fant Parkway, Shreveport. 8. Holiday Inn Hotel Shreveport, 102 Lake Street, Shreveport. 9. Boomtown Casino & Hotel, 300 Riverside Drive, Bossier City.